J/80 Worlds 2020 Venue Announced! 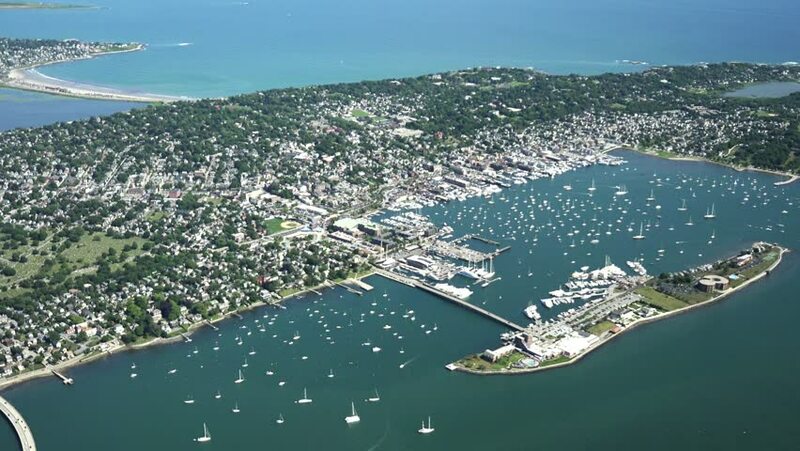 The J/80 North American Class Association is pleased to announce that Sail Newport, Newport RI has been selected to host the J/80 2020 World Championships September 28-Oct 3, 2020 on what will be the 10 year anniversary of the epic J/80 Worlds week held in Newport 2010 and almost 20 years since the very first J/80 Worlds also held in Newport. ​Mark your calendars now in what is once again expected to be yet another epic world class international J/80 event! The 64th U.S. 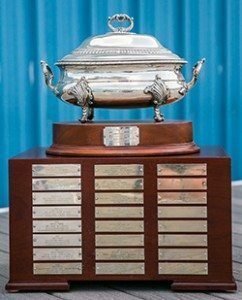 Adult Sailing Championship, AKA the Mallory Cup, is being hosted September 4-8, 2019 by the Beverly Yacht Club in Marion, Mass. The regatta is open to representatives (male or female adults) of regional sailing associations chosen by resume. Many of BYC’s members are donating their personal J/80s for the event. 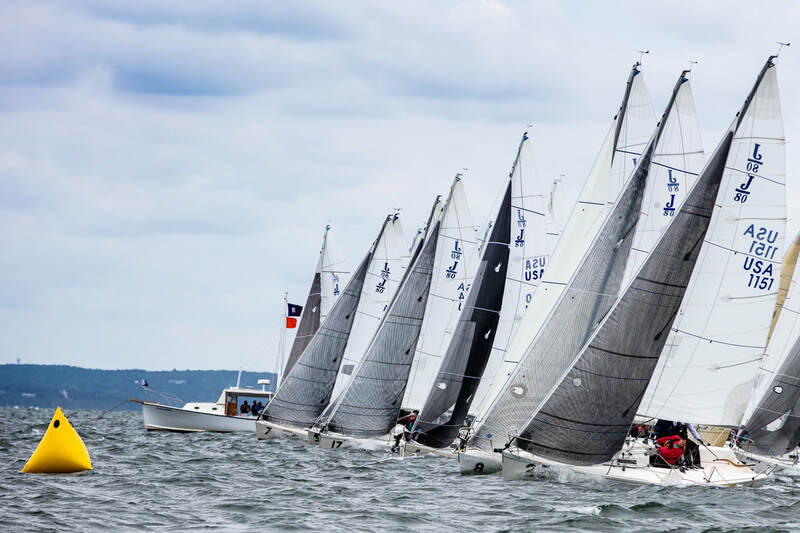 BYC, which recently hosted the 2018 J80 North American Class Championship, has a strong J/80 fleet. The J/80s will be in strict OD condition and also have a local fleet rep to attend to any equipment issues in the round robin event. According to U.S. Sailing, racing for the Mallory Trophy was first held in 1952 as the U.S. Men’s Sailing Championship. Since then it has become a more open and inclusive regatta, allowing female skippers and all-female crews. In reflection, the regatta was renamed the U.S. Adult Sailing Championship in 2013. Teams representing their Regional Sailing Association (RSA) from across the country qualify by competing at a high level in their respective RSA qualifying events or by submitting a resume. 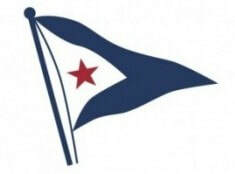 Last year, the Wayzata YC in Wayzata, Minn. hosted 35 sailors from 12 states who raced in J/22s. For more information on the U.S. Sailing adult Championship and how to enter visit U.S Sailing. The Mallory Trophy dates to the Battle of the Nile in 1798. It was announced at the J80 North American Championship in Marion that Hudson Sailing had ordered a fleet of new J80s from France. In addition, individuals are also buying new boats as well. Mark Girone of Nashville, TN is awaiting delivery of his new boat, hull 1592, after initial prep in Newport, RI. For people like Mark, this will be his third J80. 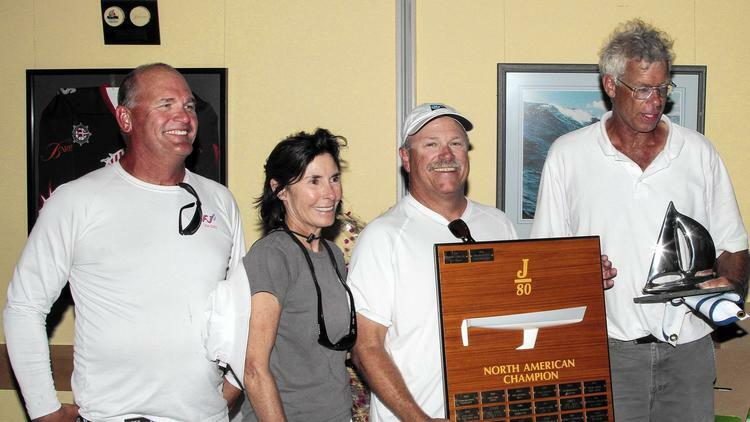 He briefly went over to the dark side and purchased a J70, but found that it didn't accommodate all his buddies that he wanted to race with, according to SW JBoats dealer and 4x J80 North American Champion Steve Lemay. who brokered the deal. The boats are shipped in a container without the keel attached (see pic above). All put together, with rig, running rigging, and trailer, sans sails, electronics and outboard, the current price is 55K. Lemay also said the quality of the boats is so high directly from the builder, that when hull 1592 was shown to Randy Borges of Waterlines fame, that he didn't feel any additional bottom work was necessary or warranted. It is hoped that enough interest will allow for a price reduction with a multiple boat order. With the J80 Worlds coming to NA in 2020 it is expected a new boat fleet will be delivered for charter boats and subsequent sales. With a dearth of used boats available, people looking to get into the class are encouraged to contact their local JBoats dealer. For those loving their existing boats, it is good news that new boats are available, the class is growing even more, and the value of their boats remains high. 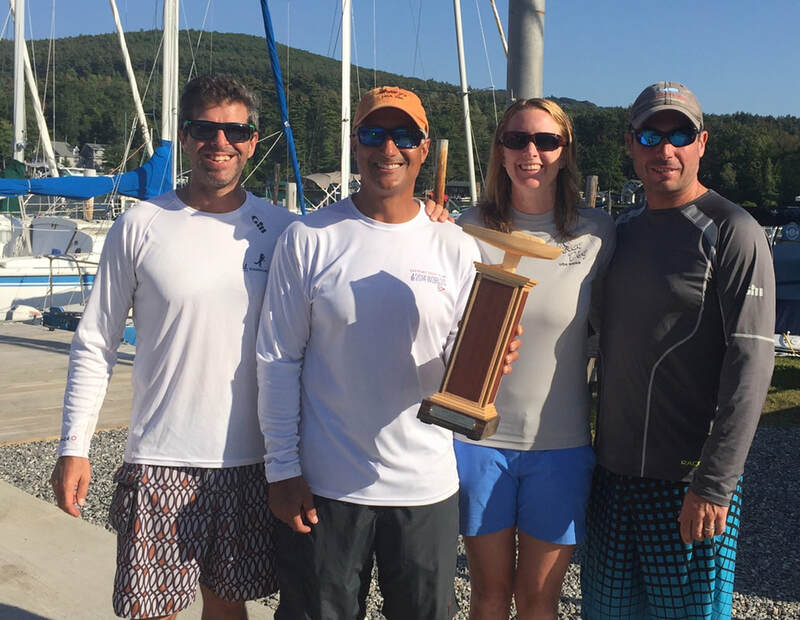 ​Chip Johns and his crew of Zander Gryska (mast), Cam Tougas (pit), and Bill Marvel (trimmer) dominated in 3 days of racing in windy conditions to win this year’s 2018 J/80 North American Championship, hosted by the Beverly Yacht Club in Marion, Mass. The crew aboard 702 Cavitica, whose worst score in the 13 races held was a 4, got shot out of a cannon early to open the competition with two straight wins on the opening day of racing on Buzzards Bay and never looked back. Congratulations to team Cavitica on a fine performance! Thursday evening at the skippers’ meeting before racing opened, Race PRO Sam Vineyard promised a brisk turn-around between races, for the 22 teams assembled, as a cold front with heavy rain and a lightning show outside the BYC clubhouse swept in a strong northeasterly breeze that would hold and build across the event. Vineyard was true to his word, getting off 5 races on day one in 13-knots and better; day two saw 15-plus knots with higher gusts in the often oscillating winds and washing machine-like chop; day three saw 15-20 knots under a low overcast cloud cover- all in unusual contrast to Buzzards Bay usual southwesterly thermal and wave set. The conditions made the starts critical as those who got off with clear air got to choose when to tack on each shift while the boats in the second row looked to clear air but often got pin-balled by the lead group. Here again, Johns and his team were masters of the start with phenomenal acceleration off the line and going the right way. They seemed to tack on every shift and while they didn’t win every race, their 1,1,3,3,2,1,1,3,1,4,2,4 scores were enough to hold off Kevin Hayes & Jeff Kirchoff’s More Gostosa from fleet 1 on Lake Winnipisaukee, helmed by Conor Hayes, who finished in second overall, 11 points behind, and 2016 NA Champ John White on 1162, who finished 3rd, with 44 points. Johns, a past Commodore at BYC, was instrumental in getting BYC to host the Championship this year. The fleet-12 Marion racers upheld the honor of the host club with an outstanding demonstration of winning starts, acelleration off the line, upwind boatspeed-keeping the boat flat in windy conditions, great tactics and sound boathandling. The excellent all volunteer BYC committee provided housing for visiting teams and quick turn-around on launch and haul at Barden’s Boat Yard. While J/80 class president Ramzi Bannura oversaw the weigh-in and measurement supported by several independent ISAF measurers. BYC’s hot clam chowder, free beer, excellent food service, and inclusive dockage made a welcome and easy focus on the racing. Photographer Anne T. Converse has posted some pics on facebook HERE. 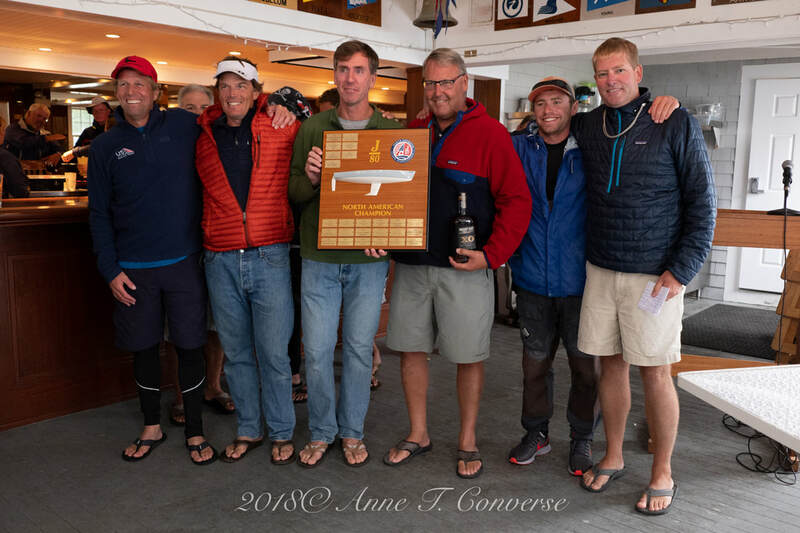 ​In a stunning display of boat speed in light air, Les Beckwith and his team on 1151 FKA came from behind and won the 2018 J/80 East Coast Championships in Boothbay, Maine this past weekend. FKA representing fleet 1 from Lake Winnipesaukee, had a solid first day of racing with a couple of bullets, but also a 10th place and a couple of mid-pack 6th place finishes in the 16-boat fleet to put him in fourth place after 5 races on the first day of racing-which was held east of Squirrel Island in a light SSW’ly 4-6 knot breeze and sunny skies. The left side of the course paid off all day with a lift off Fisherman’s Island and a bit more velocity. The standings after day one had 1153 More Gostosa, helmed by Conor Hayes leading with 16 points followed by Dan Shanahan’s Lawyers, Guns, and $, (Mangos), Ken Mangano from Annapolis being a guest trimmer, with 22 points, followed closely by Craig & Madeline Preston’s hull # 4, Sky Rocket, then Beckwith, a slim point behind them in 4th place, with 24 points. The 16-boat fleet, with boats from Maryland, Massachusetts, New York, and New Hampshire joined the host fleet-14 Maine boats back at the Boothbay Harbor Yacht Club for a traditional lobster bake with all the fixings, including a Maine blueberry sheet cake for desert-No one left Hungry! Sunday morning the wind was up a bit more to start, blowing 8-knots out of the South and PRO, Carter White set up on the west side of Squirrel Island to take advantage of that. This time the right shore lift paid dividends, especially for Beckwith and his FKA team who recorded four straight bullets to jump over everyone to win the East Coast Championship. Les and his team on FKA had 6 bullets in the 9 races run. 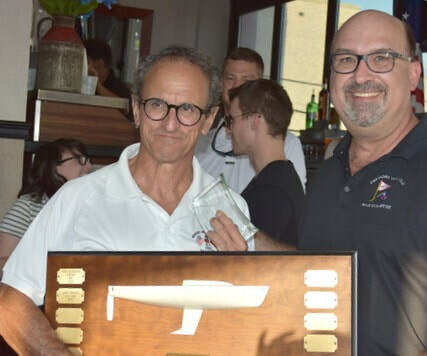 More Gostosa slipped to second overall in spite of a strong 2,2,5,2 second day, Lawyers, Guns, and $ (Mangos) took third and New York boat 381 Upsetter, skippered by Jason Viseltear won the Corinthian Award (top amateur crew) with a 5th overall. In his acceptance speech, Beckwith (4th from left) thanked the BHYC organizers and co-chairs Jen Baker (left) & Ken Colburn (2nd from left) for a fabulous venue and incredible hospitality! August is now upon us and the first Regatta of the exciting Northeast Circuit is just a few weeks away. The J/80 East Coast Championships is August 24th to 26th and is being held for the first time at Boothbay Harbor Yacht Club. 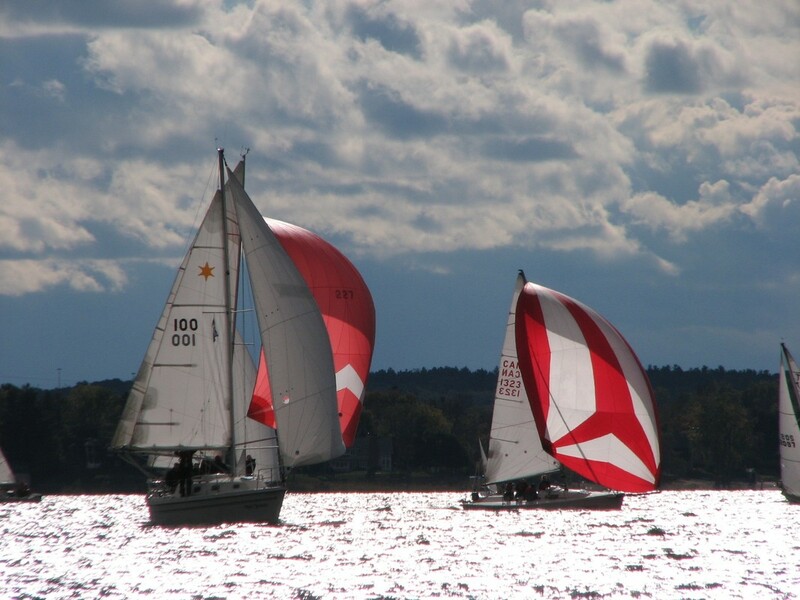 Fourteen boats are now registered for what promises to be excellent racing on the beautiful Maine Coast with an active social lineup including a Lobster Bake on Saturday evening. Launching/haul out and the social events for your crew of 4 are included in the $275 entry fee. 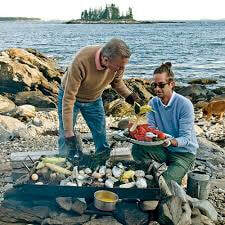 Boothbay Harbor Yacht Club is working on housing for visiting boats. The entry fee goes up by $50 as of 2000 this Friday, August 3, so get your entries in. 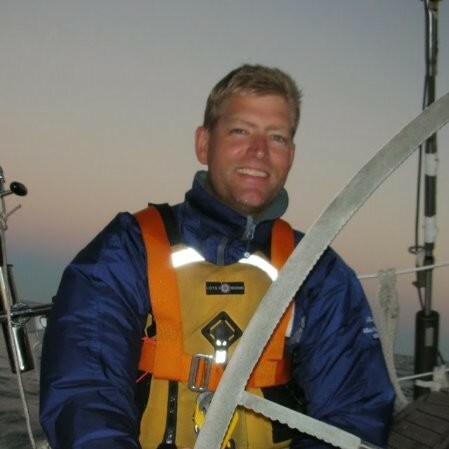 The Beverly Yacht Club in Marion, MA announced the Principal Race Officer for J/80 North Americans. It is Sam Vineyard. Sam has a history with the class, running the very successful 2010 North Americans. That Championship, also in Marion, featured 44 boats. Sam and his race committee managed to get off 13 races over three days. At the awards ceremony, he was hailed by a well known veteran competitor, This is the best regatta I have ever been to. 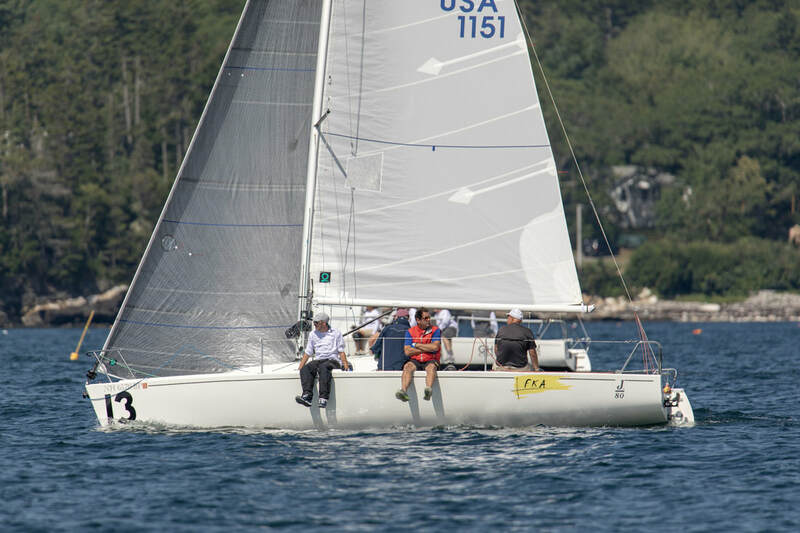 The 2018 J/80 East Coast Championship will be hosted by Fleet 14 and the BoothBay Harbor Yacht Club in BoothBay, Maine August 25, 26. Ken Colburn, and Jen Baker, the event co-chairs, have offered free housing to travel teams on a first come, first served basis. Register now! This year's NOOD in Annapolis was won by Gary Panariello in USA 1313 Courageous! It was a closely contested 8-race match with Courageous just edging out Thomas Kopps, Kopp-Out by a single point. Sailing World editor, Dave Reed, wrote a nice article about the J/80's, named "The Class That Came Before", which can be found on the Sailing World site. David Neasmith from the Nepean Sailing Club in Ottawa invites J/80 racers to the 20th Annual Nepean One Design Regatta June 16-17. 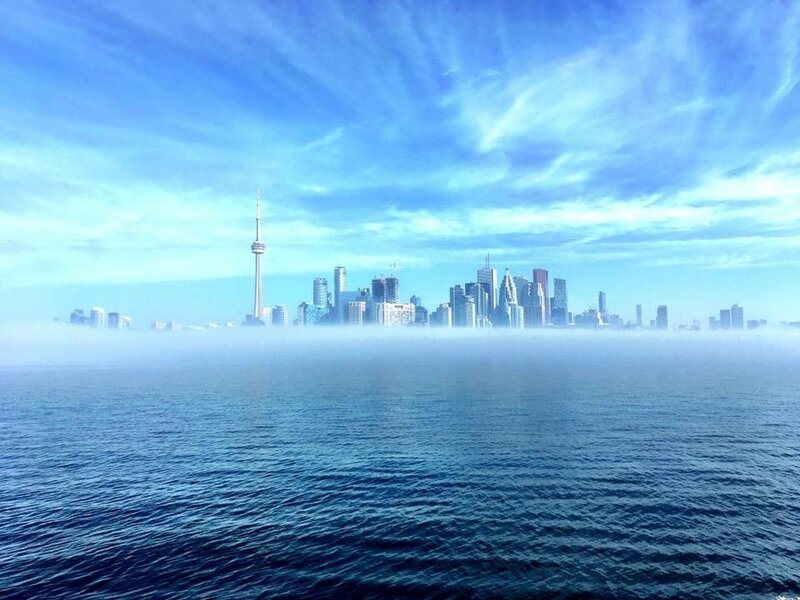 Already confirming 4 boats registered at this early stage, Neasmith hopes to attract boats from Toronto, Lake Ontario, Montreal and beyond. This marks the second year of J/80's racing at the regatta for the growing 5-boat local fleet. Nepean Sailing Club is host to over 500 keel boats and is one of the largest clubs by boat count in Canada. 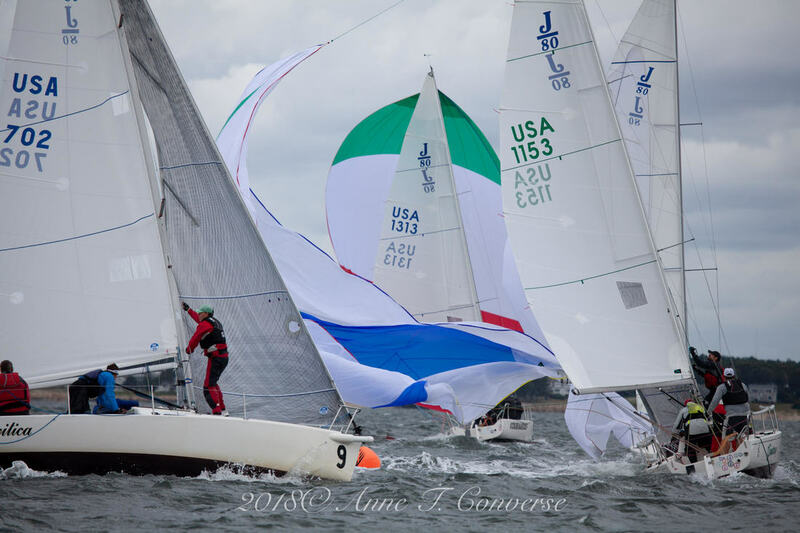 Click on The J/80 championship page above to access the 2018 race calendar of J/80 one-design events with links to local registration of each event. Five new J/80's in the last two years on Gatineau mix it up in PHRF too. Win a New Quantum J/80 or J/70 class sail and support the class with our exclusive raffle! Buy a raffle ticket to support the Class and a chance to win a choice of J/80 or J/70 set of Quantum Sails - Main/Jib or Spinnaker; winner gets choice. Drawing to be held during Annapolis NOODS 2018 or shortly after 50 tickets are sold; whichever comes first. ​Note: Raffle to abide by all appropriate process and procedures as dictated by law. Class tags or any tax or related implications not included. Class reserves the right to postpone drawing or cancel raffle at any time due to any unexpected circumstances. 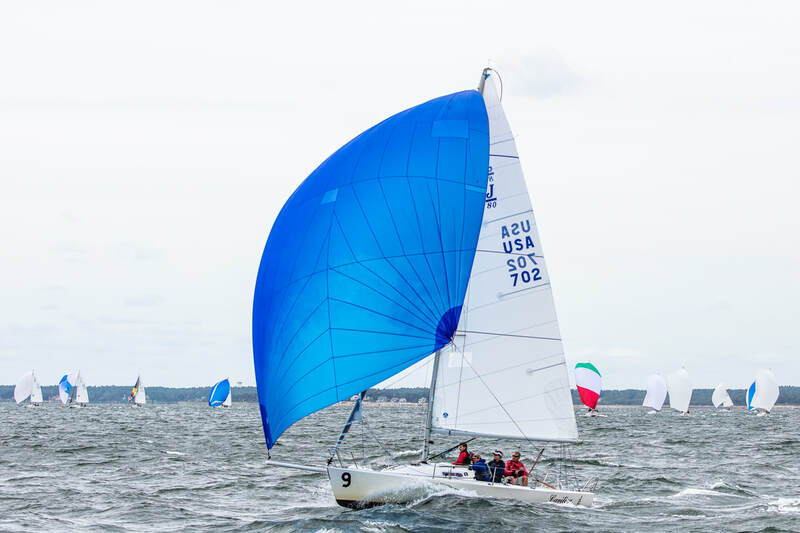 J/80 North American Class Awarded 2020 Worlds! The International J/80 Executive Committee has awarded the 2020 J/80 World Championship to the J/80 North American Class Association! A short list of five (5) potential venues is being explored then announced at the end of this coming Summer 2018. Please share your nomination through Facebook or our J/80 web site to where you would like to see the event to be held to ensure your participation. Stay tuned for more news on this topic here our J/80 web site www.j80na.com. Free J/World Spinnaker Class for 2018 Members! New J/80 Class Rules Announced! Ian Moriarty on "Wild Horses" Crowned 2017 J/80 North American Champion! This year’s J-Jamboree was held on Lake Winnipesauke from September 23rd - 25th. The event once again delivered great racing and memories for all participants. Nine teams from Maine, Massachusetts and New Hampshire participated. On Friday teams registered and attended a great welcoming party at the Lake Winnipesaukee Sailing Association Sailing Center. Racers enjoyed J-Jamboree chili, enjoyed a few beverages and bantered about racing. Racing began on Saturday morning. The day brought New England fall weather. Participants enjoyed sunny weather with temperatures in the 60s. The wind quickly filled in to 12 – 18 knots with gusts around 20 knots. The Race Committee fired off 6 races. With great planning conditions boats rocked up and down the race course. At the end of Saturday, FKA (Les Beckwith) and More Gostosa (Conor Hayes) were tied for first place with 14 points. Argo III (Jason Blais/Casey Nickerson) close behind with 19 points. Saturday evening the J-Jamboree party was held at the Lake Winnipesauke Yacht Club. This year’s J-Jamboree was held on Lake Winnipesauke from September 18th - 20th. The event once again delivered great racing and memories for all participants. Thirteen teams from Maryland, Maine, Massachusetts, New York and New Hampshire participated. On Friday teams registered and attended a great welcoming party at the Lake Winnipesaukee Sailing Association Sailing Center. Racing began on Saturday morning. The day was very warm, in the mid to upper 70’s. In the morning there was little to no wind. Due to wind conditions the first race was abandoned and the Race Committee raised the AP flag. During the delay, teams participated in water fights, friendly banter, general tomfoolery and swimming. Shortly before 2pm the winds filled in. Conditions were perfect with flat water and 8-12 knots of breeze. Four races were held. Kerry Klingler’s boat Lifted dominated the day with 3 bullets and a first day total of 8 points for the day. In second place was Ken Mangano’s boat Mango with a first day total of 12 points, followed closely by Casey Nickerson’s boat Argo III with a total of 15 points. On Saturday evening the J-Jamboree party was held at the Lake Winnipesauke Yacht Club. Racers had a great dinner, rum drinks and participated in a raffle of North Sails gear. Overnight conditions changed and fall arrived in New England. The morning dawned cool and blustery with winds over 20knots with gusts approaching 30 knots. Strong winds made for exciting and challenging conditions for all the racers. At times the scene was reminiscent of 2010 Worlds, with boats planning down wind at over 15knots and carnage on the race course!! In the end, it was once again Lifted dominating the day with three more bullets and taking home the 2015 East Coast Championship trophy! 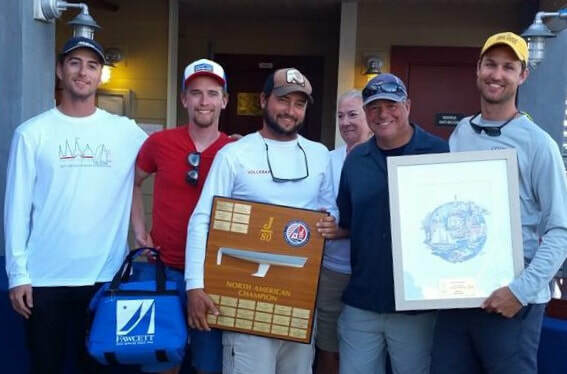 With a great day on the water and in difficult conditions Les Beckwith’s boat FKA came from behind and put three deuces on the board to take 2nd place overall. Mango was close behind taking 3rd. Complete results will be posted soon on the J-Jamboree website www.j-jamboree.org See you all next year!!! Cheers, Jeff Rabinowitz, J80 Fleet 1 Captian. Hosted by Annapolis Yacht Club, the ECC's are a prelude to the fall - winter J/80 racing season. We expect some of the best teams to be in Annapolis “testing the waters” and building their Annapolis experience in order to be best prepared for 2017. For local sailors, this is an incredible opportunity to learn from the best coming straight from the North Americans. Class act people, great competitors and fabulous sailors! Congratulations to John White and the crew of 1162 from Annapolis. Finishing with 27 points after 12 races they won this year's title of North American Champions here in Toronto! … Safe travels home everyone! 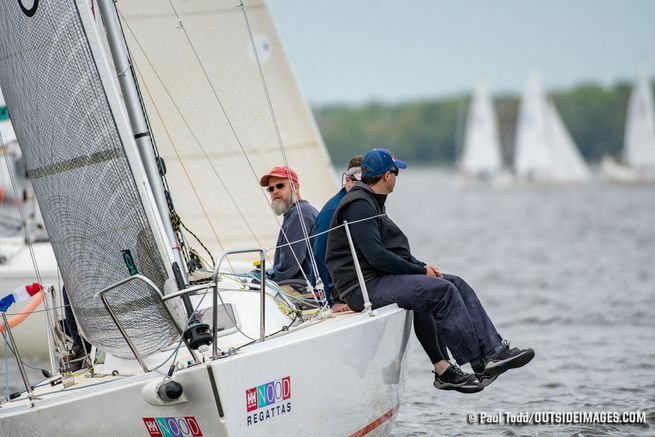 2016 J/80 North Americans - 5 weeks to go! The 2016 J/80 NA's are now only 5 weeks away and we're looking forward to seeing you there! The Organizing Committee have been hard at work booking bands, planning meals and of course, lining up a top notch Race Committee to ensure we pack as many races into the 3 days as possible! In true J/80 Fleet 20 style, it's going to be one of the friendliest and fun regattas you'll ever attend with great racing too! There's already 20 boats registered including 6 from the US and at least another 5-10 competitors expected. If you've registered but not yet paid, be sure to do that before the late fee kicks in on July 17th. When registering, we hope many of you will also join us for the tune-up clinic being hosted by our friends at North Sails One Design on Thursday August 4.